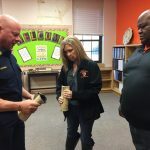 Gladewater Fire Department today made a donation of cut and prepared fire hose for the safety of Gladewater ISD campuses. Gladewater Fire Department today made a donation of cut and prepared fire hose for the safety of Gladewater ISD campuses. 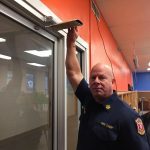 The fire hose, which is expired and unusable at the department, will now be used in the GISD campuses as a deterrent during a possible intrusion. This hose is used to slip over door closures and add to the steps campus staff and teachers can take during any possible intrusion or lockdown on campus. 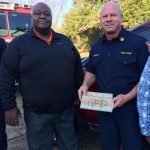 One of the GFD volunteer firefighters, Christian Allen, took the idea to Chief Crowell a few weeks back in hopes that the department had a way to make this happen. 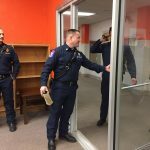 As it turned out the plan for inspection of the Gladewater Fire Department’s hose was coming due and already planned. During this inspection several sections of 1.75” and 2.5” hose were tested and deemed unusable by the department. These hose pieces were cut up, marked with GFD, and prepared for this project. Several firefighters, captains, Chief and other staff made this idea a reality. Today’s donation included a demonstration by the Gladewater Fire Department Chief and GFD B-Shift. The GISD administration, with help from Gladewater Fire personnel plans to demo these, as needed, to staff of GISD. “I was lucky to have seen another department do this and that Chief Crowell liked the idea and wanted to do it. The full-time and part-time staff made it all possible and did the work. We are just glad to be able help add to the security for the children in our district” – Christian Allen.